Meagan Erwin has been an elementary teacher for 20 years. She currently teaches 3rd grade for the Columbus City Schools in Columbus, Ohio. In addition to social studies and science, she has 90 minutes to teach math each day. Teaching 90 minutes of math with elementary students of varying experience lends itself to some challenges. Over time, Meagan developed a class structure to drive deep conceptual learning in math every day. 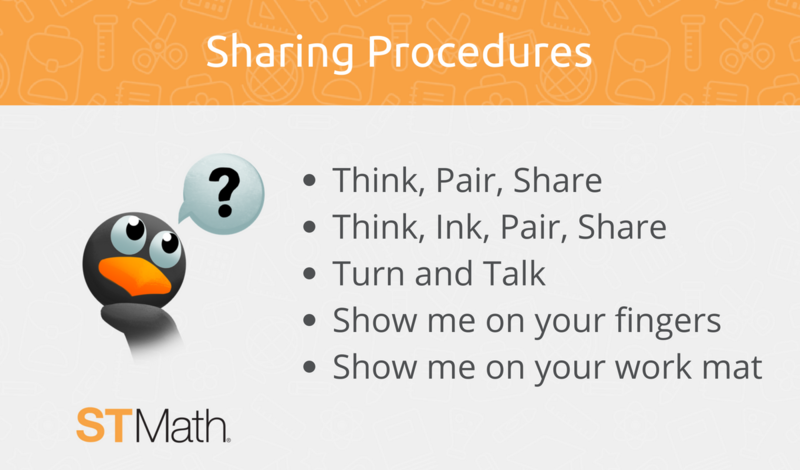 How you start your math class helps establish your learning expectations. Meagan uses spiral review questions and math talks to get students problem solving right away. Spiral review consists of bringing up questions from previously learned concepts periodically. Meagan likes to use questions from different math domains because that is how students will be tested in math. Unlike, say reading comprehension, where questions are grouped around a text, in math state tests often skip around different math concepts from question to question. “Spiral review can help students continually practice concepts from earlier in the year and keep those strategies fresh in their mind,” Meagan says. By bringing up previous concepts, it also helps students build connections to what they are currently learning, which fosters deep conceptual understanding. Another great warm-up exercise Meagan uses is math talks. 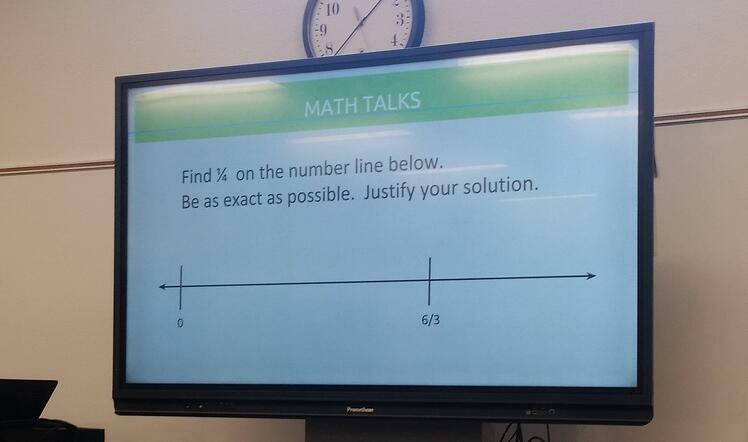 Math talks are short questions that are fairly direct, but also invite some discussion. The warm-up section signals that math class has started and gets students thinking mathematically right away. 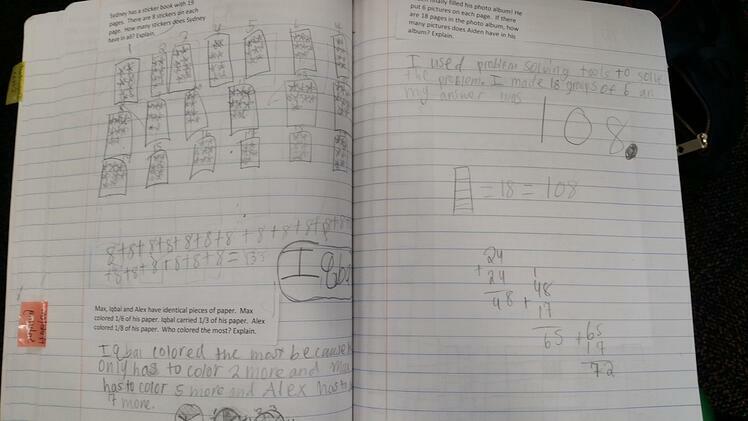 Erwin’s students each have their own math journal, which is a composition book where students cut and glue in the problem of the day. Sometimes the problem will feature JiJi or JiJi’s friends as characters. Sometimes it will feature students in the classroom or friends at the school. But the problems are always connected to the focus lesson of the day. Open-ended problem solving helps students practice perseverance—they have to work the entire time on a single question. It’s also an opportunity for students to try different strategies and different ways of arriving at the answer. I don’t ask that students be able to do every single kind of approach to solving different types of problems. But they do need to find a strategy that works for them, a way that is efficient as well as accurate. Near the end of the open-ended problem solving section, Meagan asks students to share out how they problem solved. A student will go up to the document camera to share their notebook page with the class. Meagan starts out the year leading the facilitation by asking clarifying questions, but eventually other students learn to ask the facilitating questions. In this way, students can see the other strategies their classmates are using and possibly try them out themselves. The focus lesson could be a lesson from their math curriculum textbook or a puzzle talk from ST Math. Puzzle talks build confidence, increase number sense, and flexibility with numbers. Puzzle talks are a great way to bring ST Math games into your classroom and leverage the power of the visual models. You can find a list of ST Math puzzle talk lessons on the resource site, ST Math Central. Getting students to talk during puzzle talks is important. Meagan uses several different strategies so it isn't the same format every day. She might ask students to silently show the answer by holding up their whiteboard or hold their fingers to the chest when they have the answer. Or she might give students time to “think, pair, share,” —think about their answer, pair and discuss with another student, and then share with the class. During small group intervention time, most students are working at their own pace on ST Math, a visual instructional program, while Meagan pulls specific groups of students for intervention. 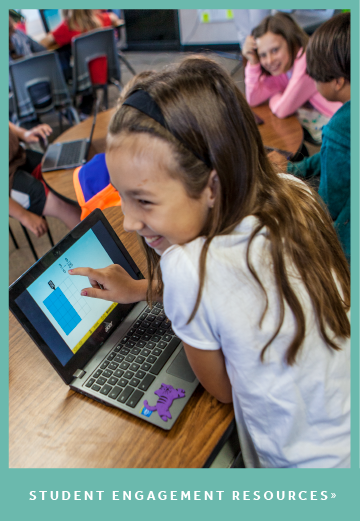 Because ST Math is visual, students with limited English and struggling readers have the same access to the program as everyone else. Students are working independently on a laptop or tablet, but they are doing more than just practicing. 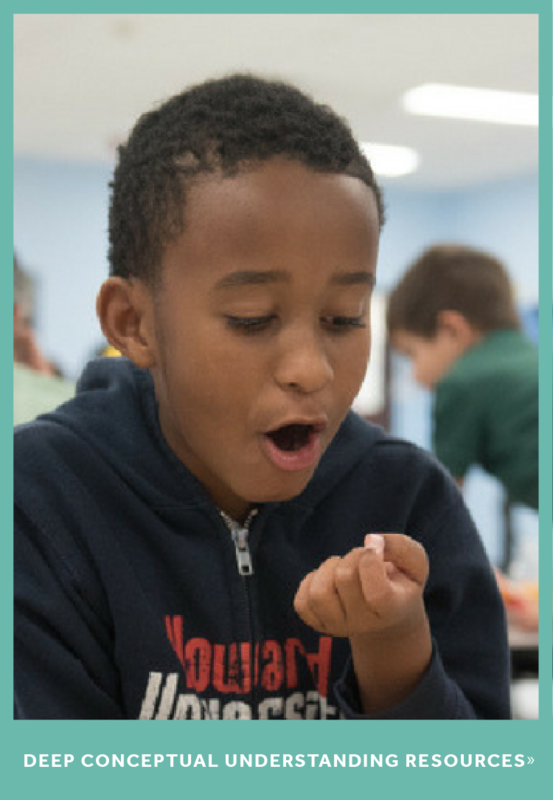 The self-paced, mastery-based program gives personalized learning for each student, while the visual models engage students in actively building strategies and conceptual understanding. Meagan takes advantage of this by requiring students to use what they call “thinking paper.” Meagan staples blank paper and resources (such as a hundreds chart) in a dedicated ST Math folder. She encourages students to work out puzzles on the paper and to use math tools to find answers. 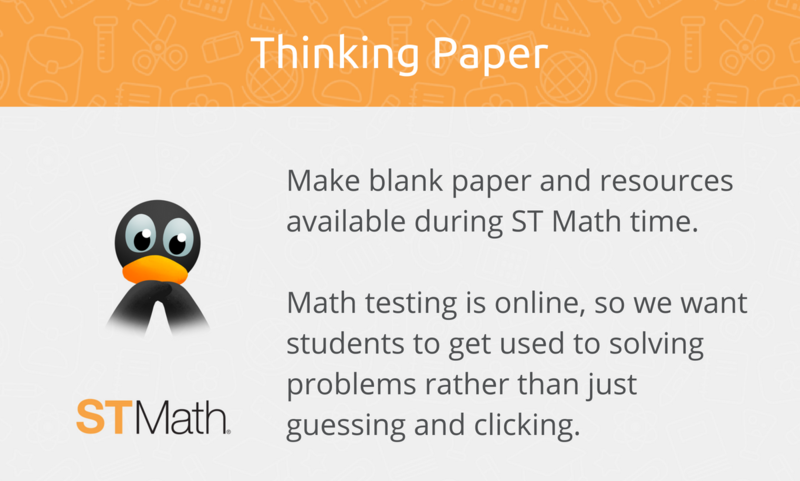 Find printable ST Math resources on ST Math Central. The small group intervention allows Meagan to ensure no student is left behind. 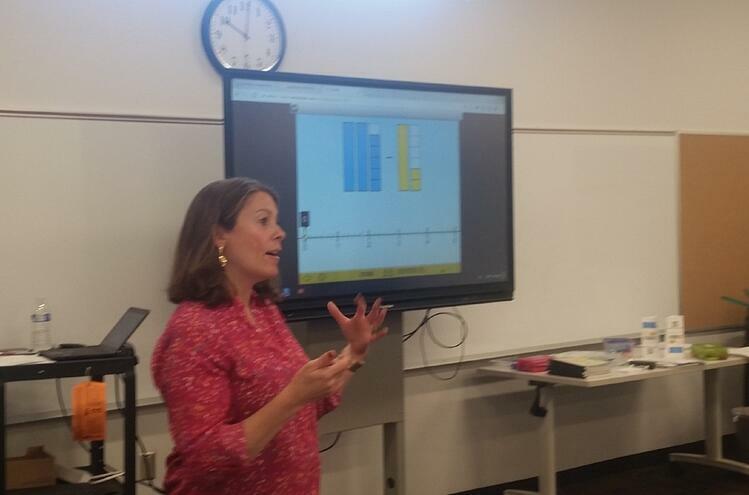 Meagan uses data from ST Math and various assessments, as well as her class observations, to identify gaps in students’ knowledge. She brings 1-3 students together and clarifies misconceptions, sometimes with direct instruction or by pulling up puzzles from a previous objective or even grade level if they missed a foundational concept last year. Meagan has developed her math class structure over time with deliberate thought into building her student’s conceptual understanding in math. 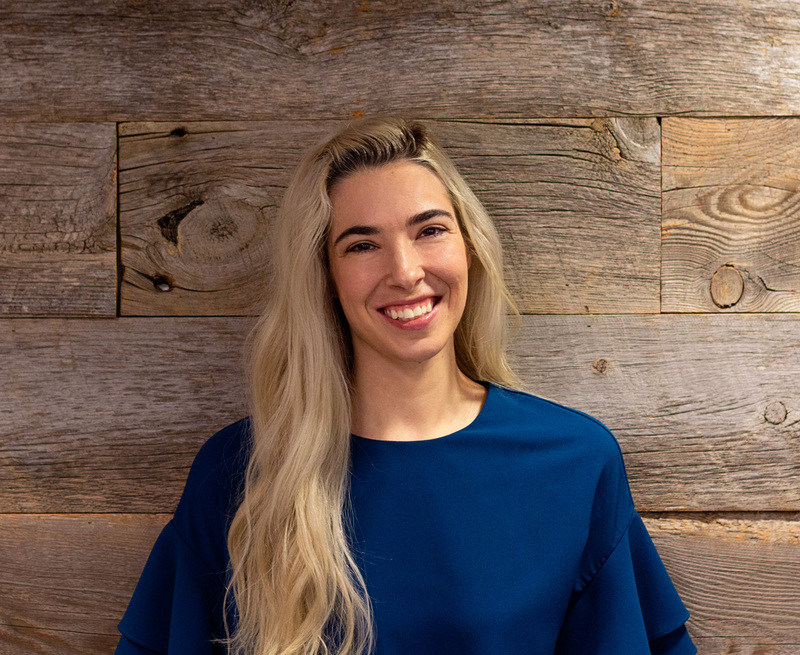 Thank you to Meagan Erwin for her dedication to her students and for sharing her experience and expertise with educators all over the country!